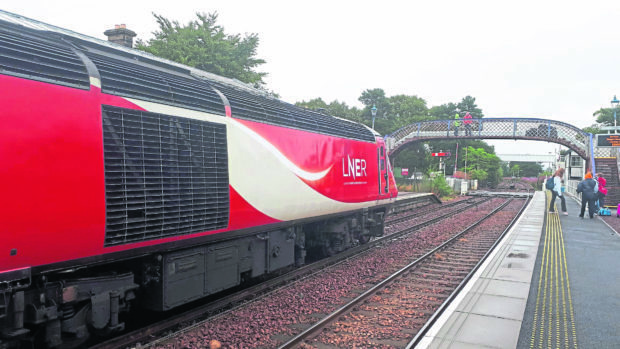 Dozens of rail passengers on the early morning London train from Inverness were left stranded yesterday after it broke down shortly after leaving the Highland capital. The main engine car of the 7.55am LNER train bound for Kings Cross lost power between Kingussie and Dalwhinnie just after 9am yesterday. Passengers were taken to Kingussie Station where they were told their tickets would be accepted on ScotRail services travelling south. However, many were unable to board the first service to arrive because of a lack of space and were forced to remain at Kingussie until after 11am for the next train. Journalist Michelle Henderson, who was on the first day of her holidays, said: “The whole journey has been a nightmare. A three-and-a-half hour trip to Edinburgh has turned into a six a half hour journey from hell. “No-one had a clue what was going on. “There was not enough room on the first train, leaving around 30 to 50 people still stuck at Kingussie. He said the fault was in relation to the power car, adding: “We agreed ticket acceptance with Scotrail so passengers could continue their journey from Kingussie on the next service. A spokesman for Network Rail said: “There was a failure to the power supply to the train at 9.05am. The line was blocked for a short period, causing brief delays to other services. He said that once the train was cleared off the main line there were no further delays.